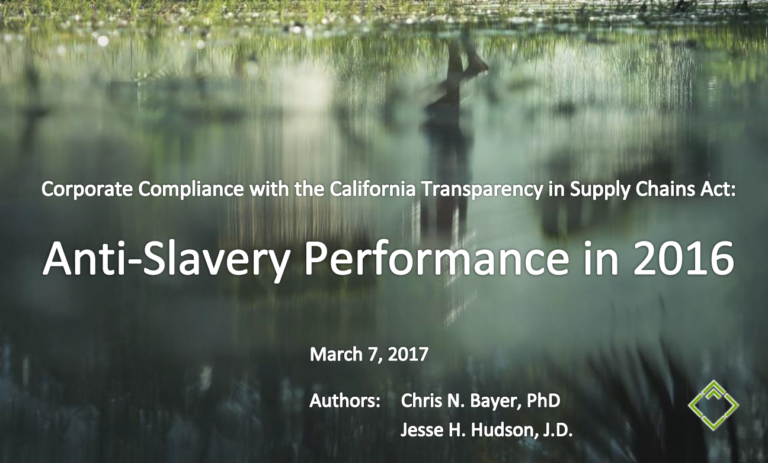 string(1276) "Resource Centre > Uncategorized > Corporate Compliance with the California Transparency in Supply Chains Act: Anti-Slavery Performance in 2016"
In 2016, a new study, funded by iPoint, was conducted in conjunction with Development International. 1,961 brands were evaluated against their disclosure compliance based on the law’s Risk Verification, Audit, Certification, Internal accountability and Training (VACIT) framework as a compliance matrix. In addition, the study recorded to what extent companies reported affirmative practice on these criteria. This second comprehensive benchmarking study on corporate anti-slavery compliance and action under CA-TISCA, also featuring a foreword from Julia Ormond of ASSET, can be downloaded here on this website.